Iowa State pulled off a huge upset and sent the Big 12 race into disarray. It was a win that Iowa State fans could only dream of. Going on the road with a backup quarterback taking over the offense against the No. 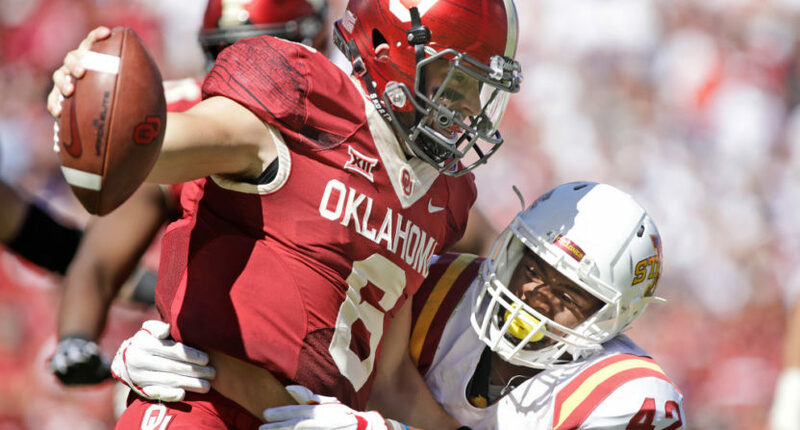 3 Oklahoma Sooners seemed like a mountain that the Cyclones would never successfully climb. But then again, that is why you play the games. Backup quarterback Kyle Kempt stole the show on the same field that Oklahoma’s Heisman hopeful Baker Mayfield calls home by outplaying Mayfield and leading Iowa State to a shocking 38-31 victory that will have quite an impact on the Big 12 race moving forward. Having one of the top wide receivers in the nation in Allen Lazard certainly helped the cause. Lazard caught just three passes for 69 yards, but it was his lone touchdown of the day that proved to be the difference-maker late in the fourth quarter of a 31-31 ballgame. Just like that, Iowa State head coach Matt Campbell has a signature win that will be used as a giant building block for everything he and his staff are trying to do at Iowa State. We are still a good way away from throwing Iowa State into the Big 12 championship conversation, but Campbell can use this to his advantage, especially when locked in recruiting battles with in-state rival Iowa. Keep in mind that the Hawkeyes failed to score a similar win at home against Penn State just a few weeks ago. Now, Campbell and Iowa State can sell the fact they managed to win against a top-five team and that they did it on the road. That’s a nice little recruiting chip. While Iowa State continues to build its program under Campbell, the more immediate focus is on what this loss means for Oklahoma and perhaps for the Big 12. That is a picture that may be coming into view soon enough, but it is far too early to suggest the Big 12 has just knocked itself out of the College Football Playoff picture in the first week of October. But it cannot be overlooked that the conference’s two clear preseason favorites (Oklahoma and Oklahoma State) now each have one loss, and one of them is guaranteed one more loss as they still have to play each other (at least once). As it turns out, the Bedlam game now takes on even more importance for the Big 12 championship picture, as the loser may be eliminated from the Big 12 Championship Game entirely. Just two weeks ago when TCU pulled the road upset at Oklahoma State, we discussed how the Cowboys are still very much in the Big 12 title race despite the early home loss. Nothing has changed on that front, thanks to the return of the Big 12 Championship Game this season. Now, the same holds true for Oklahoma. Both the Sooners and Cowboys still have a big hand in determining where their season goes from here, and for each, the Big 12 championship goal is still well within reach. So is a shot at the College Football Playoff. It’s Oct. 7. The Big 12 race is just beginning, and everyone except Kansas has a shot at it. And, for now, the College Football Playoff is still in sight for whoever can come out of the conference on top.